Women have scooped the pool in the American National Book Foundation’s 5 under 35 list of top writers aged under 35. 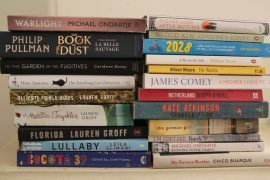 The winners are NoViolet Bulawayo for the Booker short-listed We Need New Names, Amanda Coplin for The Orchardist, Merritt Tierce for Love Me Back, Molly Antopol for The UnAmericans and Daisy Hildyard for Hunters in the Snow. The list is compiled by authors who are past winners. Interestingly, the last three books are collections of short-stories which augers well for the genre. The list was announced during the week where the NBF has been drip-feeding the long-list for its 2013 National Book Awards. Already revealed are the finalists for the prizes for Poetry, Non-fiction and Young People’s Literature. The finalists for the Fiction Prize are due to be announced Thursday American time. The full list of category finalists is on http://www.nationalbook.org/.